Alicia Vikander, Emma Stone, Justin Theroux, Jennifer Connelly and Thandie Newton strike a pose outside of the Louvre Museum ahead of the Louis Vuitton show as part of the Paris Fashion Week Womenswear Fall/Winter 2019/2020 on Tuesday (March 5) in Paris France. The five stars were joined at the event by Jennifer‘s husband Paul Bettany and fellow movie stars Sienna Miller, Laura Harrier, Mark Ronson, Lea Seydoux, Noomi Rapace, Indya Moore, Mackenzie Davis and Catherine Deneuve. Also in attendance to show their support for the brand were models Karlie Kloss, Urassaya Sperbund, Tao Okamoto, Samara Weaving, Liya Kebede, Natalia Vodianova and her husband Antoine Arnault, designer Haider Ackermann, Chinese actress Zhong Chuxi and soccer player Hidetoshi Nakata. Chloe Sevigny and Susan Sarandon are all smiles as they strike a pose at the Saint Laurent Presents: Belle De Jour – 50th Anniversary Screening held at the Museum of Modern Art on Wednesday (December 19) in New York City. The ladies were joined at the event by Kelly Rutherford, Martha Stewart, Debbie Harry, Leigh Lezark, David Alexander Flinn, Chiara Mastroianni, Martin Scorsese, and stylist Mel Ottenberg. Saint Laurent celebrated the 50th anniversary of the film Belle de Jour with a screening hosted by creative director Anthony Vaccarello and Catherine Deneuve – the evening commemorated the historic ties between the Yves Saint Laurent Maison and the film, and honored the present relationship between Anthony and Catherine. The 4K restoration of Belle de Jour was supported by Saint Laurent in 2017. Louis Vuitton had one of the most star-studded fashion shows during Paris Fashion Week and we have all the photos for you to see right here! Among the celebs attending the event were Oscar-winning actresses Cate Blanchett and Alicia Vikander, who sat together in the front row. The show took place on Tuesday night (October 2) at the Louvre Museum in Paris, France. 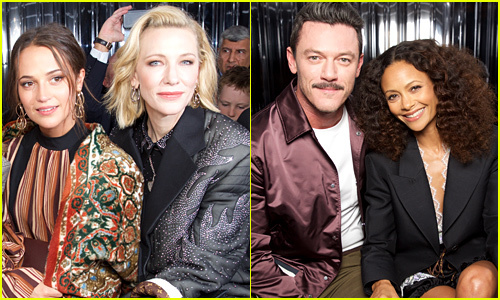 Recent Emmy winner Thandie Newton sat alongside fellow British actor Luke Evans. More celebs included engaged couple Sophie Turner and Joe Jonas, who made their first official appearance as a couple on the red carpet. Justin Theroux, Laura Harrier, Shailene Woodley, Amandla Stenberg, Paul Bettany, Nina Dobrev, Shay Mitchell, and more stars stepped out for the show. Many of the celebs greeted designer Nicolas Ghesquiere. 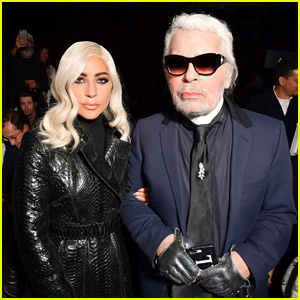 Lady Gaga sits alongside designer Karl Lagerfeld in the front row at the Celine fashion show during Paris Fashion Week on Friday (September 28) in Paris, France. The 32-year-old A Star Is Born actress was at the show to check out designer Hedi Slimane‘s first collection as the artistic designer of Celine. This marks the first time that the brand has done menswear! More stars who stepped out for the event included directors Lee Daniels and Gus Van Sant, actor Will Peltz, musician Mark Ronson, model Natalia Vodianova, and actress Catherine Deneuve, among others. Check out more photos of Gaga arriving for the show! Nicole Kidman, Justin Theroux, & More Stars Attend an Evening Honoring Louis Vuitton! Nicole Kidman, Justin Theroux, and Jennifer Connelly walk the carpet at An Evening Honoring Louis Vuitton and Nicholas Ghesquiere on Thursday (November 30) at Lincoln Center’s Alice Tully Hall in New York City. The stars were joined at the event by Jennifer‘s husband Paul Bettany, Ruth Negga, Michelle Williams, Xavier Dolan, Noomi Rapace, and Catherine Deneuve, among others. All of the stars frequently attend Louis Vuitton events and are longtime supporters of the brand and Nicholas, the creative director behind the fashion company. Diane Kruger hits the carpet at the premiere of her new movie Tout Nous Separe on Thursday (October 19) at UGC Cine Cite Bercy in Paris, France. The 41-year-old actress was joined at the event by her co-star Catherine Deneuve and director Thierry Klifa. Diane‘s new French film is set to hit theaters there on November 8. Diane has been getting awards buzz this year for her upcoming film In the Fade. She won the Best Actress award at the Cannes Film Festival back in May. FYI: Diane is wearing a full Isabel Marant look.